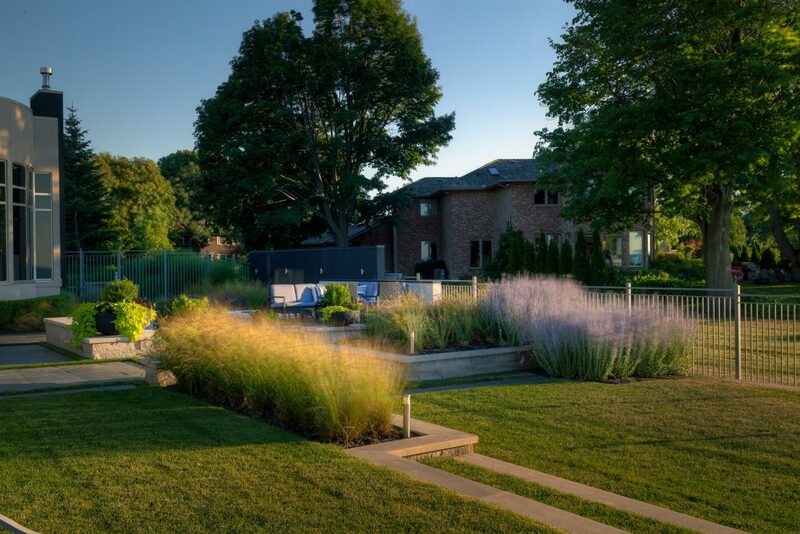 “Grass, concrete slabs, and a pool” is how Doug Glancy, owner of Kiva Architectural Design of Fonthill, Ontario, succinctly describes his first view of this backyard. His clients and their guests enjoyed alfresco dining against the background of Lake Ontario, but the view across the foreground left much to be desired. Because the property is sloping, the Kiva crew had multiple levels to play with. Glancy envisioned distinct spaces, each on its own plane: the back deck, where the family could dine and entertain friends; the firepit, which would offer a welcoming, warm spot for enjoying the view on cool evenings; the hot tub, which would offer both views and a conversation area; and the pool and grassy areas for fun and soaking up the summer sun. 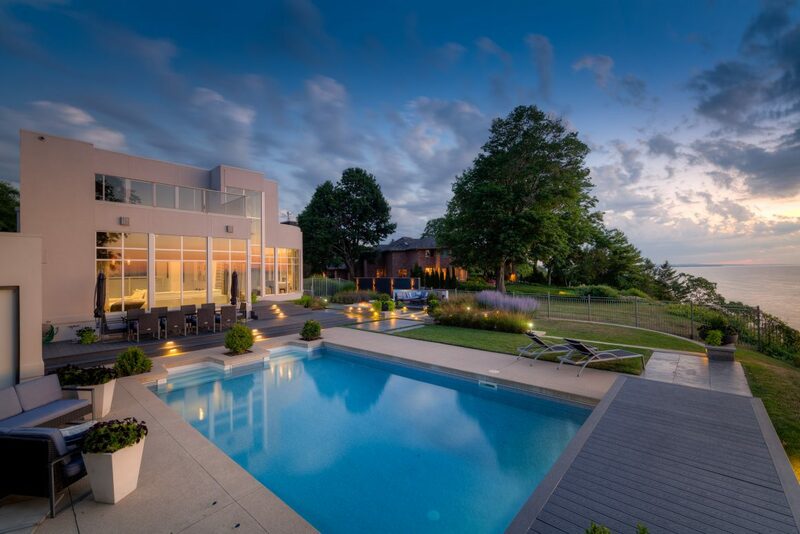 “The house is ultramodern, and we wanted the landscape to mimic that style,” Glancy says. The approach was for a contemporary, linear, sleek look. The choice of materials was partly dictated by existing elements. For instance, when the house was built a few years earlier, the side garden connecting the front and backyards was landscaped, so the backyard was designed to maintain continuity. The side garden path consists of slabs of slate, and Glancy has used the same material to pave several areas and walkways in the back. 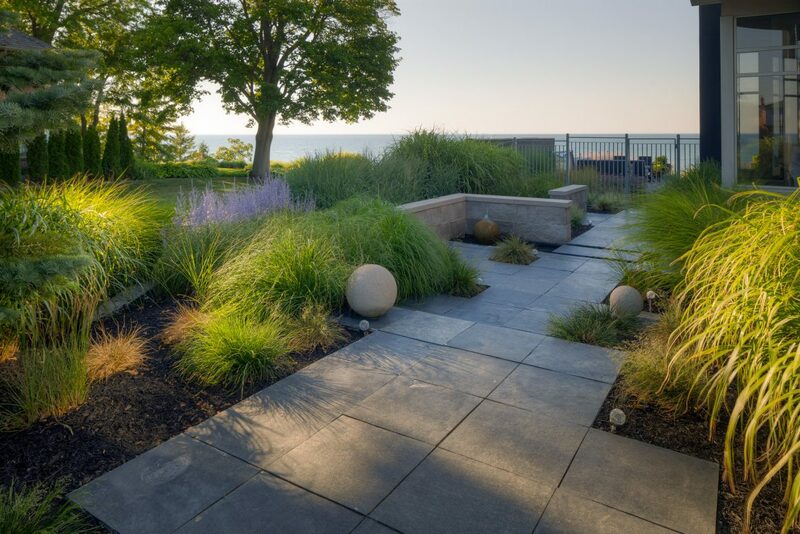 Plantings along the side are mostly ornamental grasses, with purple spires of Russian sage (Perovskia atriplicifolia) to give a streak of colour. In late summer, interest is added as some of the grasses grow fronds, and colours change from variations of green to pale yellow and rusty red. Glancy has maintained the low-key approach in the backyard. Plantings are mostly low-profile, with judicious splashes of colour, so as not to divert attention from the view. Three materials delineate the various “rooms” in the backyard. Spilling down from the house and running along much of the back and side are steps and a large platform of composite decking in a medium-dark grey, providing an elevated area for dining and large gatherings. Down a few steps is the next level, paved in slabs of blue-grey slate that will weather to the same pale tones of the side yard. 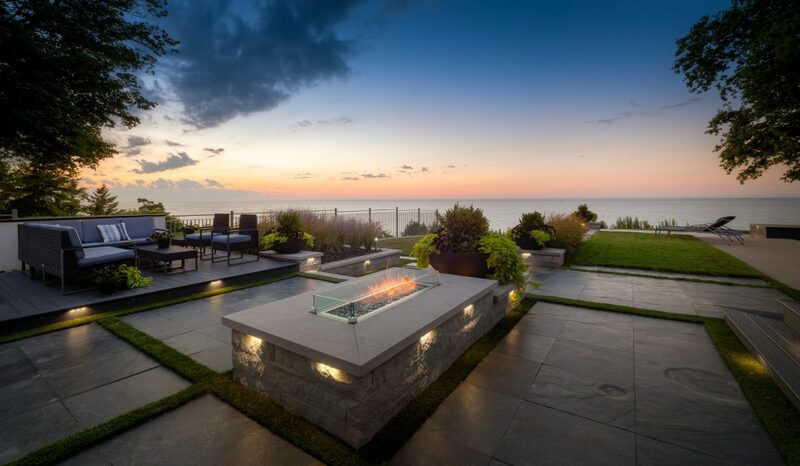 The firepit, built up with pale Indiana limestone, is rectangular and substantial enough to suit the home’s architecture but is still low-profile. On the far side of the firepit area is more composite decking into which is set the hot tub. The homeowners had originally requested a literal room – a cabana – here but realized that it would obstruct the view from the house, so they decided to have the sunken tub and lounge furniture on the deck instead. A few more steps lead down to the swimming pool and surround, which was problematic when Glancy started the project. “A couple of the concrete areas were settling and cracking,” he says. It would have been costly and time-consuming to excavate it and lay down new concrete, so he opted to cap it with a pale composite. 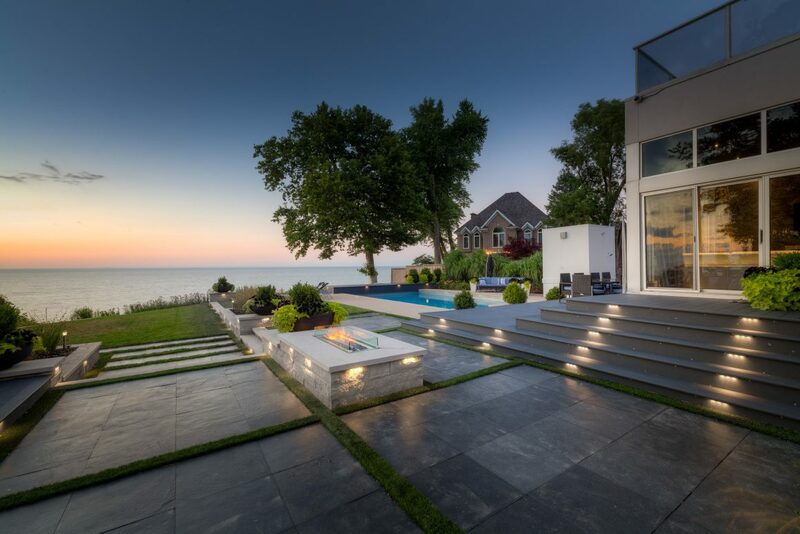 The geometric aesthetic is continued with low Indiana limestone retaining walls delineating several more grassy levels as the property slopes down to the water’s edge. Low-voltage LED lighting, mostly inset into decking and walls, ensures that the homeowners and their guests can safely navigate the area at night. 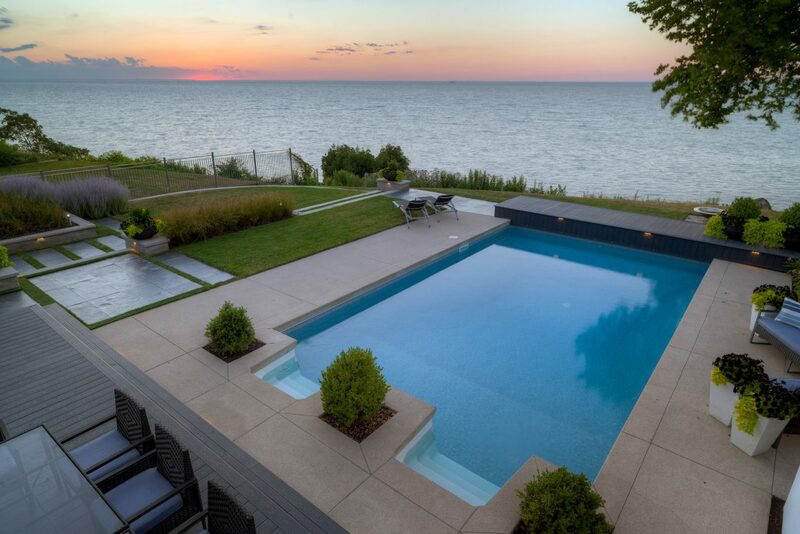 It’s difficult to compete with Lake Ontario, and Glancy has wisely provided his clients with a low-key, streamlined design that offers plenty of room for enjoying their backyard while revelling in a fine view.